Gain entry and a lock change. Pleased with job,fast pleasant service. Gain entry to property and replaced padlock, lost keys. A very efficient locksmith service from a friendly tradesman. A euro lock change on the rear door. A quick service, on site within 30 minutes, job was carried out quickly well recommended. Lock change on main entrance door. 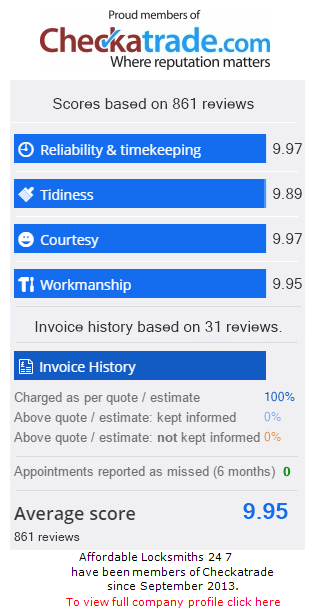 Nice service, fast call out and a good price. Gain entry to property in emergency. A superb fast service, took about 2 minutes. Very efficient. A new lock fitted and adjustment made to main entrance front door. Pleased with all work done, locksmith was very professional. Lock repair, cracked door frame. Quick service extremely efficient, very good work completed. Gained entry to aluminium door with a union locking system to the rear of the premises. A speedy lock service, a professional job completed. Lock change to main entrance door. A friendly locksmith service. He explained all the work completed and made the door safe and secure at no extra cost. Rear door lock opened and repaired. An excellent locksmith service, Very friendly, very willing to help and go the extra mile.Well recommended.